Jessica Hernandez is from New Orleans, Louisiana. In 2005, she and her family fled their hometown to find refuge from the devastation of Hurricane Katrina. This experience showed her that youth are among the most vulnerable during natural and man-made disasters. Since then, she has dedicated her life to ensuring that children in difficult circumstances are provided equal opportunity for prosperity. She earned her Bachelor of Arts in Political Science from Howard University. 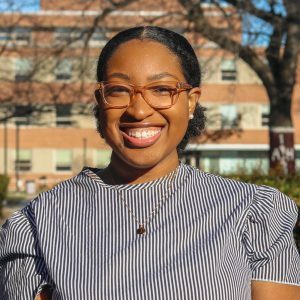 During her time at Howard, Jessica had the opportunity to work on public policy in the New Orleans Public Defenders office, the District of Columbia Public Housing Authority, the U.S. House of Representatives, and through the Children’s Defense Fund. She is a 2018 Rangel Scholar and a Spring 2018 Congressional Black Caucus Foundation Emerging Leaders Scholar. Jessica will pursue a master’s degree in Human Rights and Humanitarian Policy with a specialization in Conflict Resolution. She hopes to develop her skills as a Crisis, Stabilization, and Governance Officer as she represents USAID as a Foreign Service Officer. The initiative is a collaborative effort funded by the U.S. Agency for International Development and administered by Howard University.